It got cold. The air smells amazing, the mosquitoes have gone, the sky is a perfect blue and summer is over. My friend Kyle Cassidy is out here for a few days to shoot photographs of Miss Maddy, and also shoot Lorraine's first ever Roller Derby Bout on Saturday with the Chippewa Valley Roller Girls. He and I went for a walk in the night and wore warm coats, and played Children of the Corn in the meadow, and you could smell the distant winter on the air. Actually, I should clarify. The above things are what Kyle is officially here to shoot. Unofficially, he's here for the cats. 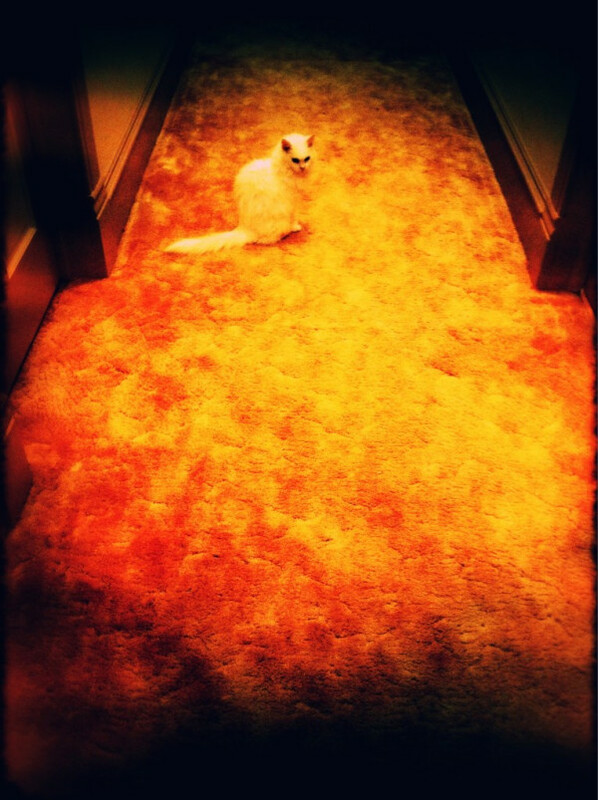 This is his iphone picture of Princess looking like the Cat of Doom from a horror movie. Tickets go on sale Friday, 9/16 at 10AM PDT. Tickets go on sale 9/16 at 10:00am. Tickets go on sale 9/16 at 11am PDT. Let's see. 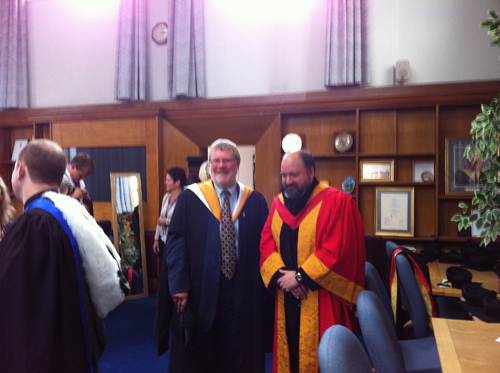 My old friend and collaborator Dave McKean was made an honorary Doctor of Design in Wolverhampton. I do not think I have ever seen him look so uncomfortable as in these photos. Wish he'd kept the hat on, though. Which is to say, congratulations Dave. If you're in the UK, get to Foyles to see Dave's "Magic of Reality" exhibition http://www.foyles.co.uk/Public/Events/Detail.aspx?eventId=1338- the original art he made for the book he's just done with Richard Dawkins is on display. Right. Sleep now. How on earth did it get this late?